I’ve talked a lot about Warhammer 40k 8th Edition on my blog this summer, as I was increasingly excited for the new edition of one of the most popular wargames around. Well, I’ve been playing quite a bit of it now, as well, so wanted to come back here and give some general thoughts and ramblings about what I think of the new experience! 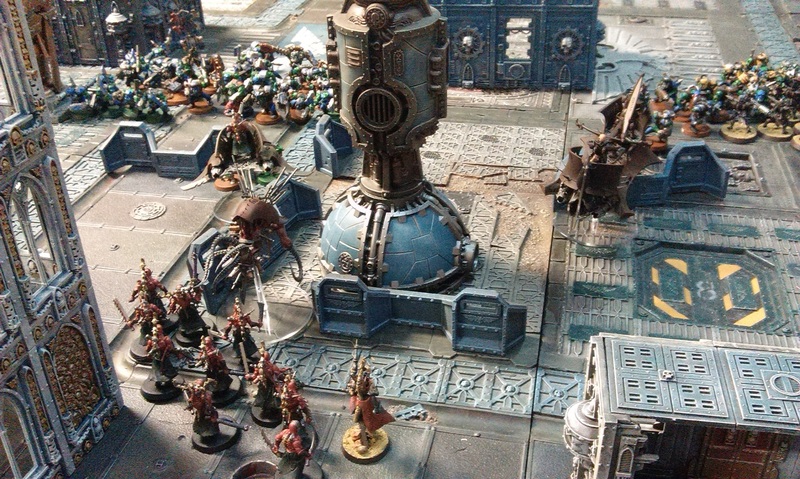 I talked about my first game of 8th back in the middle of July, and have since played three further games, for a grand total of four: two with Necrons, and two with Dark Eldar. Three of those games were against the same guy and his Orks, and I’ve also played against Blood Angels. So! First of all, I have to say that the game is just so much better than it was during 7th. 8th Edition has been out only a couple of months, and already I’ve played more games of it than I had during the entire run of 7th. In part this is due to my circumstances changing, as I finished with my degree course right when 8th came out, so never really had the time in the last edition – but then, I still had some time, but could never really fathom the complicated rules set in order to spend an entire day playing through a game. So there is that to consider. 8th Edition also just flows much more smoothly. I’m still very new to the game, with just 4 games to my name right now, so I can’t pretend to be some kind of expert, but I have to say, it’s a lot easier to just get on with a game rather than going through the endless, “What does this do again?” sort of book-keeping. So I do enjoy that. I think the way that combat has been streamlined, it has led to a lot more cinematic moments being achieved. True, it was always possible to get exciting times during 7th, but the fact that you’re not consulting endless charts and trying to remember stats and equations means you can focus instead on what is happening in the game. 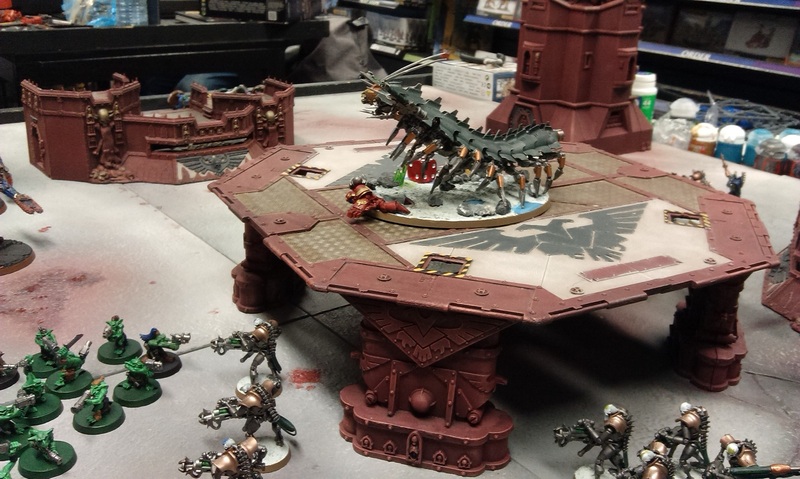 Such as my Necron Overlord swooping down onto a group of Boyz and a Warboss to avenge the savage beating of a phalanx of Lychguard. There wasn’t a lot of, “Now, this is an open-topped skimmer, so it can go so many inches, and the guy inside can still do his thing…” and all the rest of it. You just move, shoot, charge and smash face! I like that a lot. I never played Dark Eldar in 7th, but I have been enjoying them tremendously so far in 8th. Only had two games with them, but I think they definitely feel like the kind of army I like. There’s a lot going on with them, and trying to find a good balance within that army has been causing me some head-scratching as I write up list after list of potential musters, but I think it’s the sort of army that I’m going to enjoy trying to get to grips with, which is the main thing for me! I had my most recent game with the army just last Friday, which is part of the reason why I wanted to write this blog for today. I’d been going quite heavily into the Kabal route from the start with these guys, but as I’ve managed to bring them to the table, I’m enjoying the Covens units so much that I feel I may begin to slant my build more towards the flesh-sculptors. Wracks are a unit type that I never thought I’d enjoy having as much as I currently do, being really quite a diverse bunch. We were talking on Friday about how they’re basically a close-combat orientated unit, yet the Acothyst can take what is essentially a sniper rifle, which just seemed to blow a lot of peoples’ minds. Getting into close combat, with a haemonculus nearby to buff their toughness and a Cronos to allow for re-rolling failed to wound rolls, it can be very useful! I’ve yet to try out any Wych Cult units in my army, so I think the Reavers and Wyches may be making an appearance next time, just to see what happens! Of course, as I said before, there is a lot going on with them, and I don’t ever seem capable of remembering Power From Pain for these chaps! Turn 1 shrugging off wounds on a 6 is stupidly useful, yet can I remember I can do that? Of course not! I definitely need to get more games in where I can try to remember these things! So all in all, 8th Edition has done something that 7th never could, and gotten me wanting to play 40k with more regularity than I ever thought possible. I’m definitely pleased to be in the hobby right now, but more than just for the artistry of building and painting minis, but for playing games with them, too! It’s not-quite May the Fourth! So in celebration, I wanted to showcase an old favourite of mine, Star Wars Miniatures! 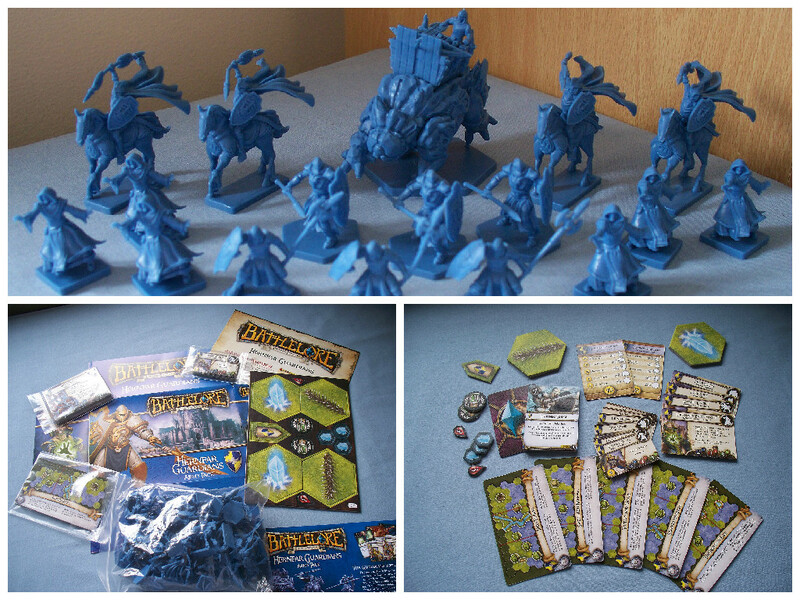 This tabletop miniature wargame was produced by Wizards of the Coast back between 2004 and 2010, partly in support of their RPG. 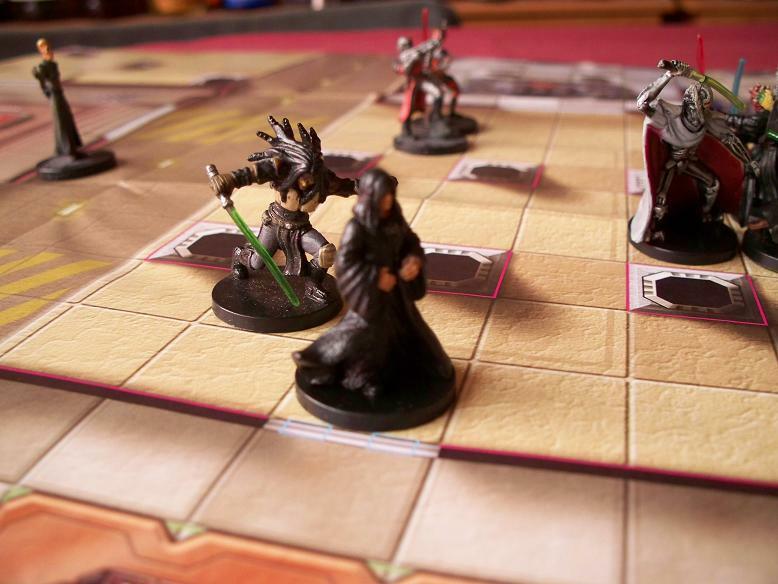 The game featured 34mm miniatures, and was a collectible game that was distributed through blind-buy booster packs of little plastic minis. 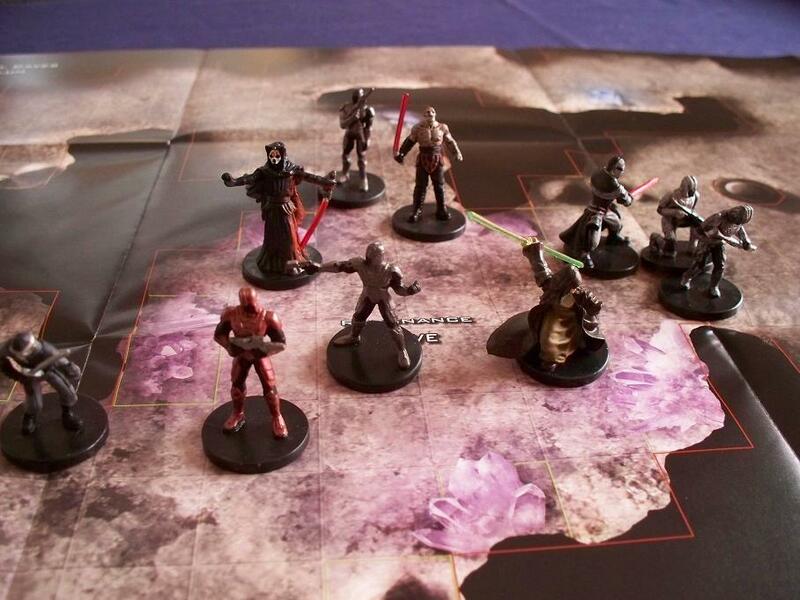 Sixteen sets were produced over the six years, featuring miniatures from right across the Star Wars universe, from Knights of the Old Republic to Legacy-era. The game itself was fairly straightforward. Miniatures come with a stats card, which shows the abilities of each mini, along with the Hit Points, Attack and Defense ratings, and how much damage they deal in combat. Each mini also has a points cost, with which you can build squads for the skirmish game in something approaching a balanced manner. So, you assemble your guys, and pitch battle to your foes – the goal of the game is to wipe out your opponent’s entire squad, though three Ultimate Missions books were published for the game, along with a couple of scenario sets for Endor and Hoth that give some element of thematic gaming. To wipe out your enemies, you need to attack them, obviously. I seem to remember that ranged fighters can shoot across the entire map at you, while melee characters need to be much closer, base-to-base. When attacking, you roll a d20 and add your character’s attack value. If it is higher than your opponent’s defense value, you deal damage to the figure based on your damage rating. If you roll a natural 20 you deal double damage no matter what the defense rating, but if you roll a natural 1 then you miss no matter what. If a model’s HP is ever 0, it is removed from the game. Arica (Mara Jade’s alter-ego) has Blaster Barrage, which allows her to attack each legal target once in her activation. She also has Twin Attack, which allows her to attack each opponent twice. She also has Cunning Attack, which gives her +4 attack and +10 damage against targets who have yet to activate. She also has Sniper, which means other characters do not provide cover for any of her attacks. I was once on the receiving end of this, and had seven miniatures wiped out in one attack frenzy. Maris, who has 80HP remaining, moves adjacent to Vader (40HP left) and spends a Force Point to make a Lightsaber Assault, giving her two attacks. She has Twin Attack anyway, so she’ll be making four attacks. She hits him twice on the first attack, but his ability Dark Armor reduces damage received by 10 if he makes a saving roll of 11, which he does, so is left with 10HP. Vader has the Lightsaber Riposte ability that allows him to spend 1 Force Point to immediately counter-attack, so he successfully attacks and reduces Maris to 60HP. He also has the Djem So Style ability, which allows him to make an immediate counter-attack when hit with a melee attack. He successfully makes this, and reduces her further to 40HP. But Maris still has two attacks left, which she makes successfully – ordinarily, Vader would be dead at this point, but due to the order of attacks in the rules, Djem So Style will trigger before damage is applied, twice, which means Vader kills Maris as Maris kills him. That was an awesome little aristeia on the battlefield when it happened – I don’t even remember who I was controlling now, I just remember it’s awesome! There are all sorts of weird and wonderful interactions like this, and it’s part of what kept me playing the game for so long, I think! 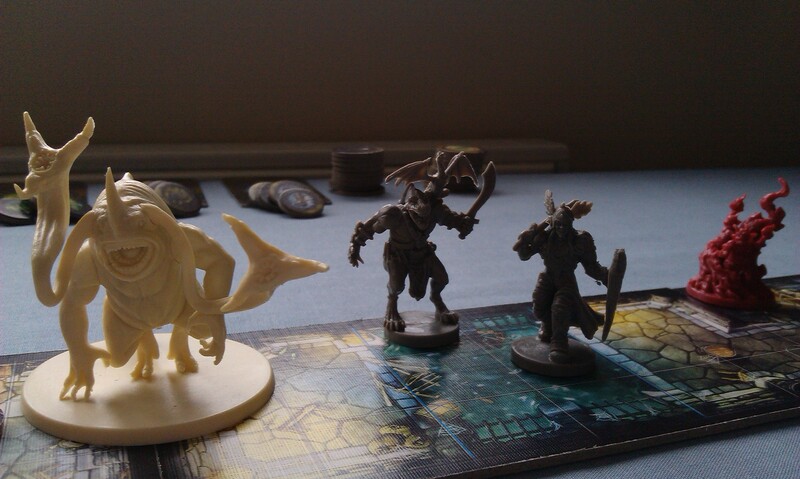 Another part, of course, are the awesome miniatures! Over the course of the game, things changed of course. 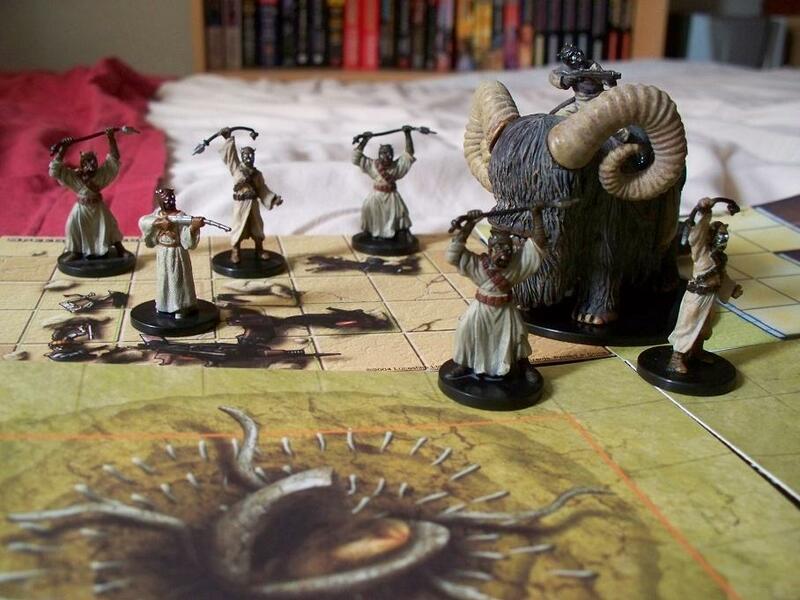 The first ten sets came in sets of 60 miniatures, and featured a number of scenario packs and intro packs as a way of allowing entry into the game. 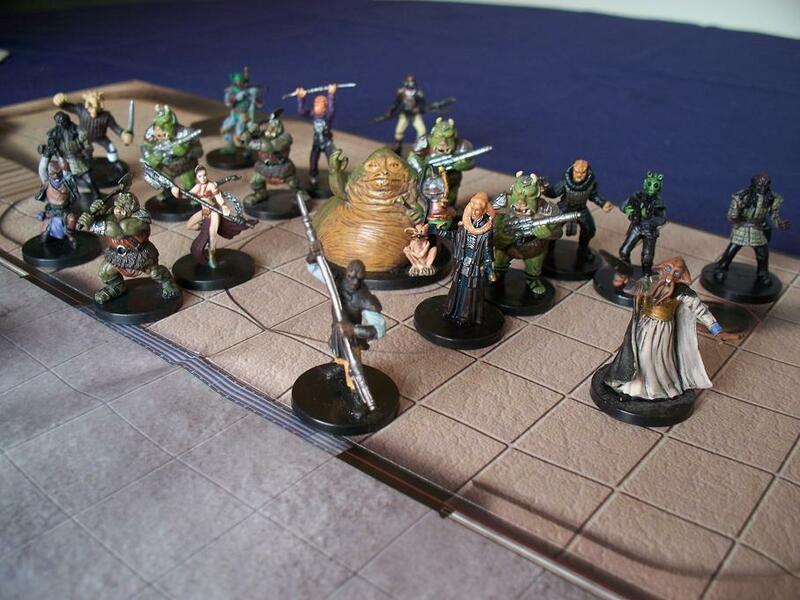 Universe, the third set, introduced huge miniatures into the game, such as the Rancor above, and this trend continued in two further sets – Bounty Hunters and The Force Unleashed. Scenario Packs continued after the Clone Wars set shifted distribution to 40 miniatures per set and redesigned the stat card, however the quality seemed to drop off a little, with some truly horrific sculpts and paint jobs featuring in the last six sets. However, both Imperial Entanglements (the new set when I eventually went all-in on the game) and Dark Times do have some really wonderful miniatures, and the final set, Masters of the Force, is noteworthy for including the Dejarik holomonsters which, I’m firmly convinced, would have formed a side-game if Wizards hadn’t announced dropping the Star Wars license a couple of months prior to the set’s release. Of course, it’s not all figures – over the course of the game, there were vehicles and bigger droids produced, the massive Rancor figure from up there, and also the biggest “miniature” I’ve ever seen – the AT-AT walker! I remember having to import this from Australia, as I couldn’t find one anywhere for sale in the UK. 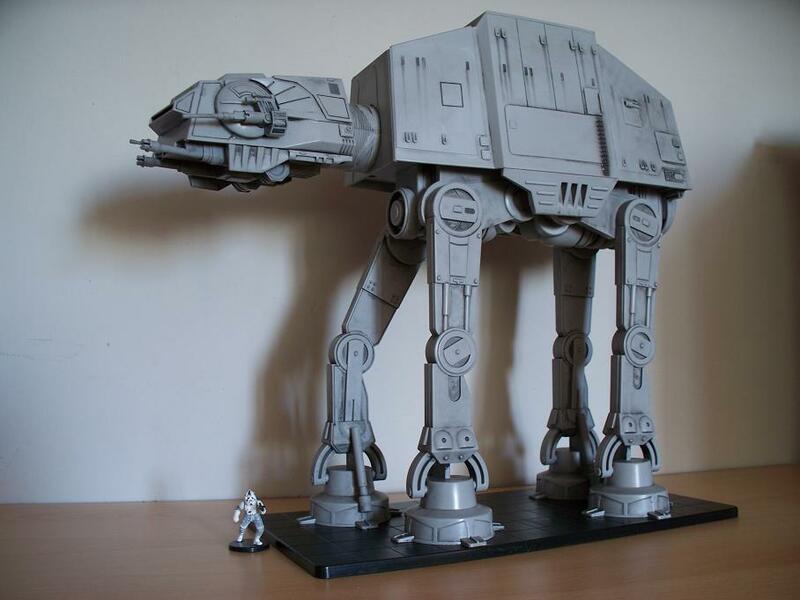 This thing is huge, and I think it’s pretty much in-scale with the rest of these things – the AT-AT Driver mini above certainly looks about right, anyway! This was a really special event upon release, and I remember it advertised with annoying frequency in comics and the like. I’ve never actually used it in the game, as it just seems too cumbersome, but by god, what an amazing addition to the collection! I’ve talked before about Wizards and the way they went from fully supporting their game lines to almost-dropping the Star Wars licence overnight, so I won’t labour that point again here. Suffice it to say, it was a similar story to the Saga Edition RPG, where we had scenarios and map tiles produced that you could download from the site, then suddenly all of that just stopped. My favourite tiles include the Sarlacc pit, which is tremendous fun to use as a terrain feature! Christopher West is the cartographer for most of the maps and tiles available in the game, and once Wizards stopped producing the game, he continued to produce maps – albeit more generic maps with the sci-fi theme – via Kickstarter, and buying the first five of these map bundles was actually my first foray into the crowdfunding website! 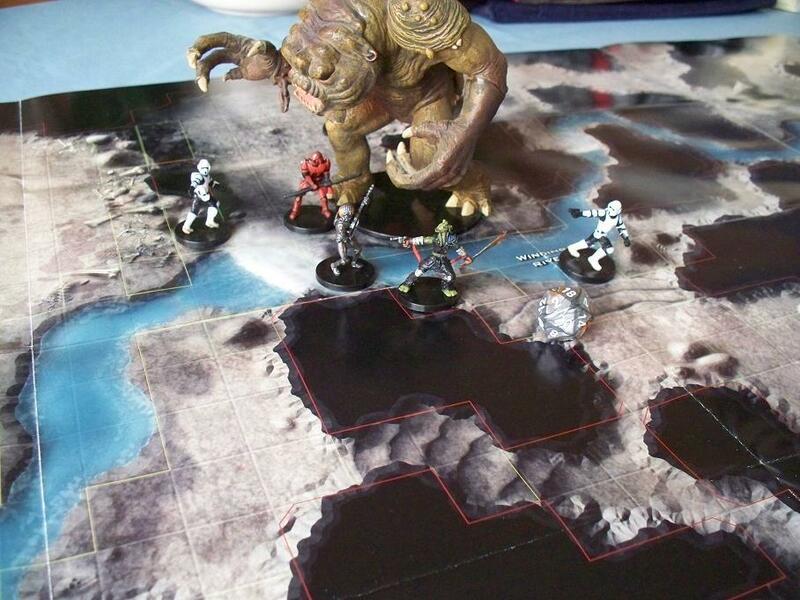 Many of the pictures in this blog – that with the Rancor, for instance – are games being played on these fantastic maps. The reason I’m harping on about them is they’re still available via his website, and are of awesome quality, and really useful not just for this game, but if you like running RPGs with maps and minis. It’s not just Christopher West who provides maps, of course. There are plenty of fan-made map tiles and full-size maps available to download and get printed up. One of my prized possessions is the Jabba’s Palace map, which is just spectacular, so much fun to play on. It has all of the locations from the movie, leading to so much thematic play! After all these years, Star Wars miniatures are still fairly available on the open market, which continues to surprise me. The minis are pretty well compatible with FFG’s Imperial Assault, which I recall drove demand up for the older, pre-painted figures for a time. Having so many of these things, I’ve often considered down-sizing my collection, though in doing the prep for this blog, and checking out all of those photos once again, it’s brought back so many awesome memories that I feel this game is something I never want not to have. So much of this game is bound up with my enjoyment of the Star Wars universe at large, I will freely admit that I’m probably looking back on most of this far too fondly. As I mentioned, the adverts for the new sets were in every new Star Wars comic that month, and whenever a new thing happened in the universe, such as the Legacy era being opened up, a line of miniatures wouldn’t be too far behind to support it. They may be kept in boxes on top of the wardrobe under an inch-thick layer of dust, but one day I might get them down again and put a squad together, and re-live those early days of my gaming life… That would be awesome! 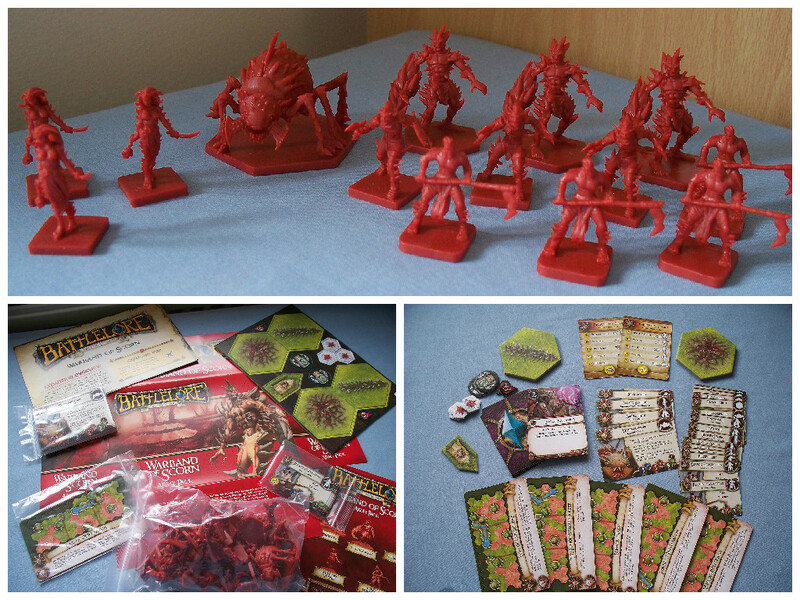 All of the photos in this blog have been shared on boardgamegeek over the years – you can check out the full range of my contributions here. It’s the first game day blog of 2016, so it’s time for something particularly exciting – we’re taking a look at the Age of Sigmar! I got to play my first game yesterday, and despite needing to call time because the store was closing, it was truly an amazing gameplay experience! It’s been pretty well-covered by the internet since its inception back last July, how Age of Sigmar replaced 8th edition of Warhammer Fantasy. I’m not going to cover all of this, but instead want to focus on the actual game, and my own thoughts on it. It’s probably worth mentioning, though, that I never played Warhammer Fantasy, because there seemed like too many rules that got in the way of having a decent game. So yeah. Obviously it’s a tabletop wargame for two (or more) players, where you collect, build and paint an army of little people to battle. I’m guessing that, if you’re reading this blog, then you know all of this stuff – I’ve been on about this stuff since July last year, after all! With regard to building armies, you can pretty much field whatever you want – I think most people, certainly anecdotally around me, are still interested in fielding specific armies. In my local area, people have really embraced the narrative aspect of the game, and as a result have really fluffy armies that focus more on telling a story and having a great time. Which I think is the true spirit of the game. Of course, there are no points costs in the game, which means armies are potentially unbalanced, but most people have quickly adopted a system based on wounds, with additional restrictions such as no more than three monsters/war machines, wizards can’t summon wizards, etc. I’m all for thematic play, being a roleplayer at heart, so adding such things doesn’t really concern me, as I’d love to just play a really fluffy kind of thing regardless of wounds or types. There is an infamous four-page rulebook that outlines the six phases of the game: hero phase, movement, shooting, charge, combat, and battleshock. In this respect, I find it to be extremely similar to Warhammer 40k, which I have played once, so felt not entirely like a newbie. There’s a really great flexibility around nominating your general, who can literally be anyone, and who automatically benefits from at least one “always on” command ability. You no longer need to have a specific character model to lead your army, but rather, you can have anyone lead it. For instance, I have a fairly large (100-ish wounds) Stormcast Eternal army, but the Lord-Celestant on Dracoth model isn’t properly painted yet, and the other Lord-Celestant model I’m not happy with, so I decided that the Liberator-Prime is now my general, and it’s fine. I love this #AgeOfSigmar stuff! So in your hero phase, you get to cast spells with wizards and activate abilities that can benefit your guys. You then move, which is fairly obvious, and also have the option to run – if you run, ordinarily you can’t later shoot, or charge into combat. 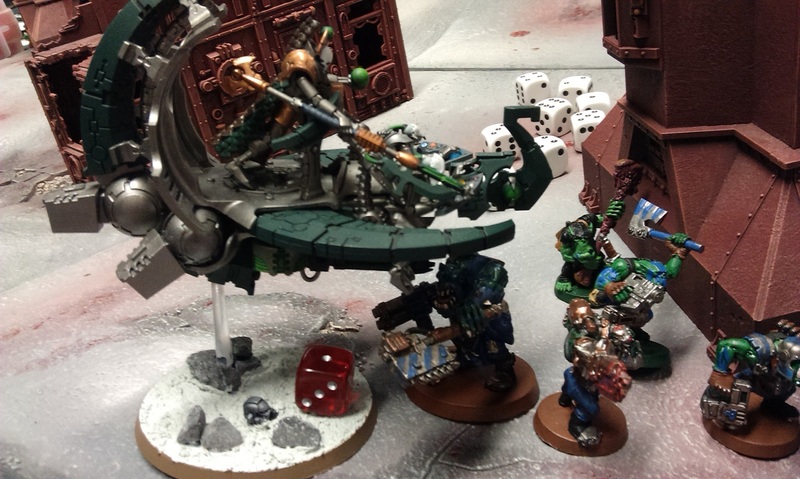 Any models with ranged weapons can then shoot at enemy units within range, before models then get to charge if they are within 12″ of an enemy unit. You may be within range, but you still have to roll 2 dice to find how far, in inches, you actually charge (though the Prosecutor models roll three dice). Combat is pretty intense as, once all movements and charges have taken place, combat is fought back and forth between the players, so you can’t fight with all of your guys in one go. This is partly where the strategy comes in, because if you charged in with three units, you fight with one, but then your opponent will fight back, and can choose any unit locked in combat, not necessarily the one that was attacked but another. So you can set it up so that your opponent doesn’t fight you back but instead goes for one unit, or anything really. It can be really intense because, as the attacker, you don’t know if all of your units will make it through to attack… lots of stuff to take account of! Attacking can be a bit of a drudgery, if I’m being totally honest here, and does kinda come down to blunt mechanics. Special rules (more shortly) do make this more interesting than it could be (for instance, 40k) but it is still a little bit meh. Basically, you roll dice equal to the attack value of each attacking model, aiming to roll the “to hit” value of the weapon. Any of those dice that were successful, you then roll again, aiming for the “to wound” value. The defending model(s) then get to make a save roll, deducting any “rend” value of the attacker, and if they succeed, then the wound is deflected; if they fail, then they take a wound – often, this is enough to kill a model. It’s actually kinda clunky, but long-time wargamers are no doubt more than fine with it. Finally comes the Battleshock phase, where units may try to escape the battle depending on how many losses they took that round. This can be catastrophic, especially if you start to see models haemorrhage. There is an argument to have large units, as for every 10 models in a unit you add 1 to the battleshock roll, but this can obviously become unwieldy. In my first game, I was attacked by a unit of Beastmen Gors and the unit was so large it wrapped around two of my units of Liberators! 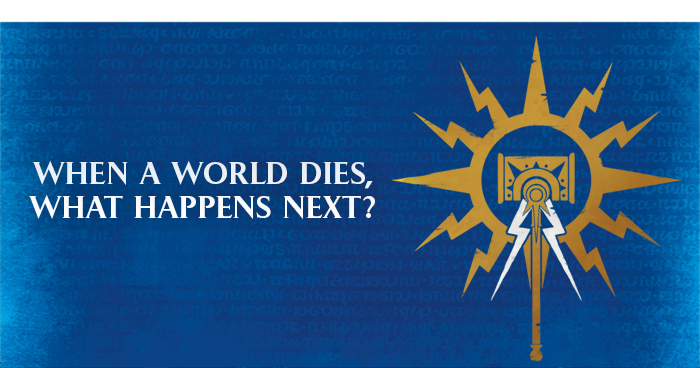 Age of Sigmar is a tabletop wargame, but more than anything, it’s a scenario-driven game. Of course, you can play it so that you’re basically trying to kill your opponent off, but everything that has been published for the game so far has come with at least three scenarios to play through, which have special rules to alter gameplay, special abilities for each side, etc. The game really seems to come alive here, as you’re trying to hold back the horde, or recover lost relics. It’s still a fight between two (or more) armies, but there are some truly wonderful opportunities for roleplaying, and telling the story. I had my first game yesterday at my local GW, where my Lions of Sigmar faced off against the savage Beastmen in the “Retrieve the Relic” scenario from the Stormcast Eternal battletome. It was really great, despite the learning curve. I mean, the basic rules are fine, you’re just doing the basic moving and attacking, but it’s where the other stuff comes in that really gives this game depth. So many people have criticised the rules for being too simplistic just because they’re four pages long, but pretty much each and every unit available for the game has its own specific rules that add that depth, allowing for all sorts of shenanigans to go on and really alter the game. Each unit has at least one weapon, obviously, and most have a selection of special rules, which are pretty much thematic to the unit, or the faction, and can allow for some truly epic storytelling moments. For example, the Retributor models have a special rule that allows any to-hit roll of 6 to basically do two instant wounds to the enemy. This became so good (weirdly, I was able to roll 6s when rolling for them!) that they became a specific target, but kept surviving, and became the battlefield legends! Age of Sigmar seems to finally be seeing more reasonable reactions, following the storm over the summer. I guess the people who were really annoyed by the loss of 8th edition have ranted themselves hoarse and, for the most part, moved on to other systems (or just stuck with 8th). The most recent round of releases for the game – the Everchosen before Christmas, and now the new dwarf Fyreslayers – seem to have less instant-dislike reactions, even on sites like Bell of Lost Souls. It seems like the game may finally have found some breathing space, and we’re seeing people take it on board for what it is. It’s anecdotal, of course, but my own meta seems to be overwhelmingly positive for the game, with late night game Wednesdays being absolutely packed affairs at my local store. While I appreciate that the game might not be universally popular, it’s certainly something that I’m really glad to have found, and really looking forward to playing more of this as the weeks and months roll on. It’s time for another game day here at spalanz.com, and in light of the recent Warhammer-fest I’ve been having, I thought it high time I learn to play with cardboard discs. I’m sure you agree. It’s time for Diskwars! 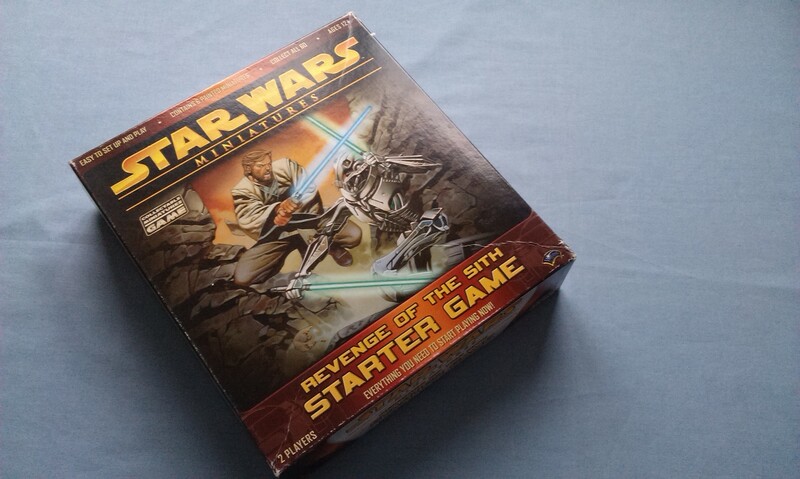 This game originally came out towards the end of 2013, and I promptly snapped it up, at the time being a huge fan of FFG and slightly in mourning for the end of Warhammer: Invasion, one of the great LCGs that will no doubt be featured in my blog before very long. Diskwars seemed like a fun game, anyway, but unfortunately its timing seemed to be a bit off. See, that summer, FFG announced two huge new games before GenCon, then proceeded to saturate GenCon with even more hugeness – Diskwars was announced right alongside Battlelore 2nd edition, and Eldritch Horror followed soon after during the GenCon weekend, as well as the epic-scale ships for X-Wing, while huge stuff like the Star Wars RPG Edge of the Empire went on sale. Amid the hugeness, Warhammer Diskwars seemed to get a little lost, and its eventual release wasn’t exactly the event FFG no doubt hoped it would be. But like I said, I snapped it up, and it has been gathering dust ever since. A couple of times I’ve tried to get to grips with it, but haven’t really gotten very far – but no longer! Let’s take a look! First thing I remember about this game was being surprised at how the components were just basically sheets of cardboard, with a small deck of cards. But this is a combat game played through cardboard discs – no minis! I suppose Games Workshop don’t want other companies making plastic figures of their stuff anymore. The artwork, so far as I can tell, is entirely derived from the Fantasy RPG and aforementioned Invasion LCG, which is kind-of a good thing, as the artwork in those products is just astounding. There are four armies in the box – Empire, Orcs, High Elves and Chaos – along with a bunch of tokens and a small deck of cards. As well as the discs, there are terrain pieces that can be used to populate the battlefield and interact with the players. 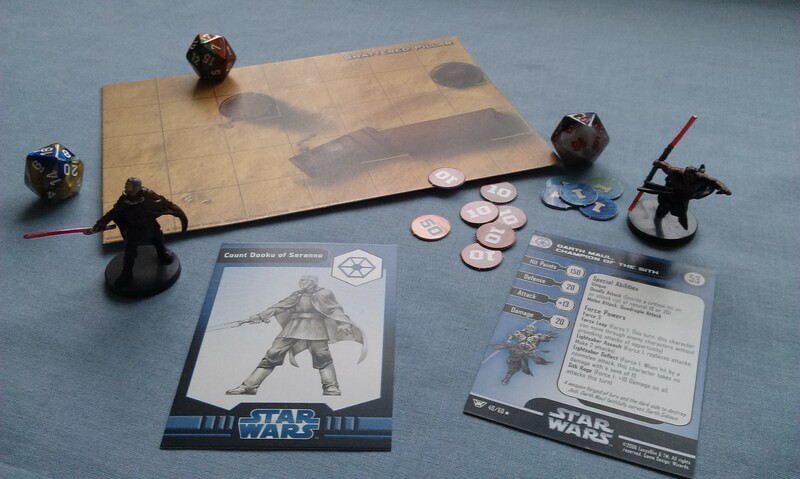 The discs look good, and feel quite sturdy – FFG are of course known for their vast amounts of tokens (and their dials, of course, but there are no dials here! ), but these feel different, like they have a smooth coating rather than that linen-feel or whatever it’s called, so it feels like these discs will likely hold up to a lot of playing. Each disc has all the relevant information on it to be used in the game. Starting at 12, we have the unit’s attack strength in the black circle, and counter strength in the white circle; following round, we have the toughness, then the stamina. At the bottom of the disc is the race and set info, alongside the hero’s recruitment points/unit’s cost. Finally, moving back up the left side is the hero’s command rating, and finally the movement value. What do all of these mean? When a disc is activated, it is moved end-over-end a number of times equal to its movement value. Let’s use Archaon the Everchosen from the above picture as an example, because I usually play Chaos in the LCG. When Archaon moves, he is flipped four times – or, until he lands on top of another disc (pinning it), whichever happens first. An activation token is then placed on the disc to show it has been activated, which I feel is a lot handier than it probably sounds! After movement, discs have the opportunity to use a focus ability, which is something Karl Franz in the above picture possesses. Discs can also make a ranged attack, which is denoted by a “play” symbol and a number of icons representing dice. Ranged attacks are made at one of three ranges – short, medium or long – as determined by the range ruler. Dice are rolled, which determine the results – there are hits, critical hits, scatter and Chaos results possible. A fourth range, ‘siege’, denotes anything outside of the scope of the range ruler provided with the game. In the above picture, the Hellcannon rolls three attack dice during its attack. If it rolls any hits, these are ignored as the attack was made at siege range; any critical hits rolls will deal damage equal to d6, however. Furthermore, if any Chaos symbols were rolled, it can move the Hellcannon, potentially trapping enemy discs, dealing 5 points of Impact damage as denoted by the keywords. Ouch! For me, this game seems to be at its most exciting in the melee phase. 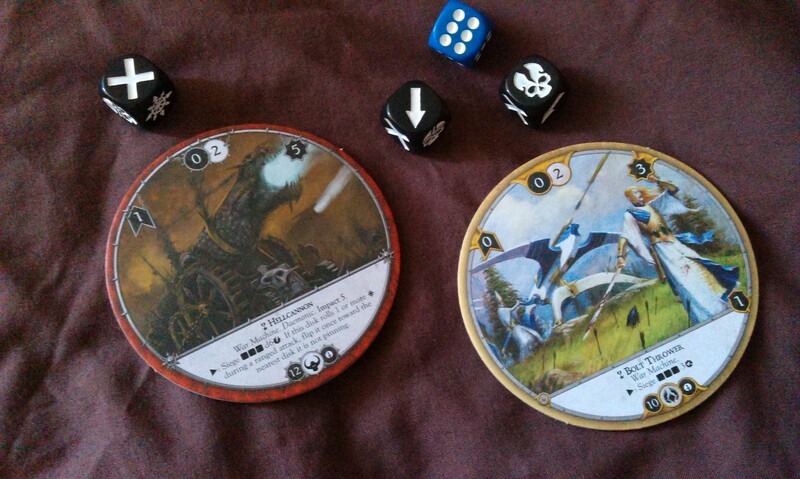 If Archaon were to land on top of another disc – let’s use Tyrion, as I normally play the LCG against Tony, who is High Elf through-and-through – he deals damage to it equal to his attack strength (the black circle). Something I think is really cool, the defender (pinned disc, this case Tyrion) deals damage equal to his counter strength also, which really reflects that sort of melee chaos of battle. When dealing damage, tokens are used (of course!) to denote each point – if a unit is dealt damage equal to its toughness, in this case 5 for both Archaon and Tyrion, he is instead given a wound, which ordinarily removes that unit from the battlefield as a casualty. However, some units have a stamina value, which denote how many wounds they can take before being removed. Continuing the Archaon vs Tyrion deathmatch, Archaon deals six points of damage to Tyrion, which is more than his toughness so he takes one wound. Tyrion deals 5 points of counter damage, which equals Archaon’s toughness, so he also takes a wound. Both heroes have stamina values of 1, so the next time they attack, they would be removed as casualties simultaneously. Something I find pretty hilarious is the possibility for a Scrum to happen, where a disc that is already pinning another disc is then itself pinned by a third disc, becoming both the attacker and defender. Such battles are fought top-down, so you may have thought you’ve successfully pinned your opponent, only to become attacked as well, where you may not survive the combat! It sounds fantastic, anyway! Returning to the Archaon vs Tyrion situation, however, some important bits of information have thus far been overlooked. Each disc has some keywords and effects that would trigger, changing how that deathmatch would turn out. First of all, Archaon has “Impact 2”, which means he deals two points of damage when he flips onto Tyrion. Furthermore, his effect deals one point of damage to each disc within short range when he engages Tyrion, who is within short range at this time. This wouldn’t have any further effect on the combat, however – while damage persists from round to round, whenever damage equals or exceeds a unit’s toughness, it is all replaced by a wound token, so while Archaon winds up dealing 9 points of damage here, he only needs to deal five to make a wound, and the other 4 points are wasted. Tyrion, however, is a much stronger foe, as he rolls a d6 when he engages, and deals a wound on the roll of a 6. As each unit is considered to engage the other as soon as combat begins, Tyrion can potentially deal 2 wounds to Archaon, which would remove him from the battlefield, leaving Tyrion with just one wound and able to fight again! Archaon also has the keyword Caster, and both have the keyword Hero. These mean nothing in and of themselves, but interact with the Command cards the player has. Remember the Command value of a hero disc? That determines how many Command cards you have in your hand. Command cards are resolved during the Activation Phase, which actually comes before the disc movement bits I’ve just been talking about, but I was excited to talk about discs first! 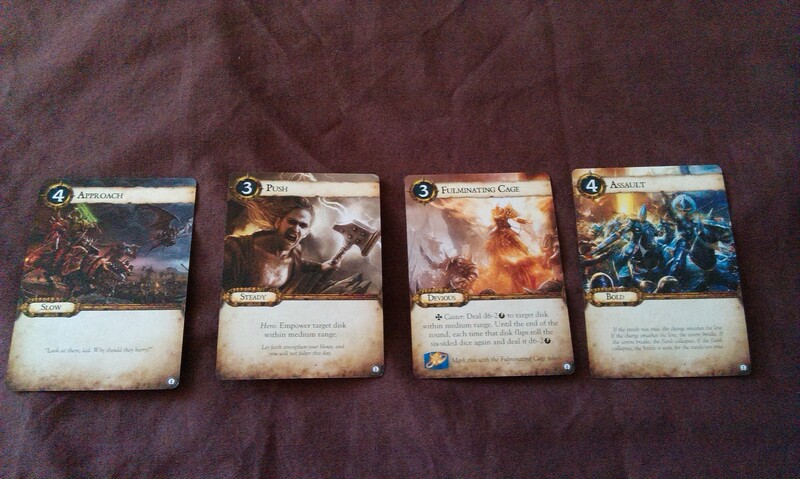 These cards determine the course of your actions during that round of battle. To begin, each has a strategy – slow, steady, devious and bold. These are resolved in a specific order – bold before steady, steady before devious, and devious before bold, with slow activating last. The number at the top of the card shows how many discs you can activate that round, so it can sometimes pay to be slow! Finally, the card has an ability that will trigger during the round, from passive abilities that will affect anything to specific abilities that interact with certain keywords. Furthermore, each faction has a specific card that directly interacts on the battlefield, for which a faction token is used to show the ability has been used – such as Fulminating Gaze for the Empire in the above picture. Command cards are a good way to interact with the game, making it more strategic than just flipping discs and killing your opponent’s guys. There is an even more exciting type of card in the game, however – Scenario cards! As you may know, I love thematic and scenario play in games. Scenario cards are used in Diskwars during setup to affect the game in some specific way. Players then get one card in secret which provides an objective to achieve, for bonus victory points at the end. It’s an interesting way to add more depth to the game, I feel. 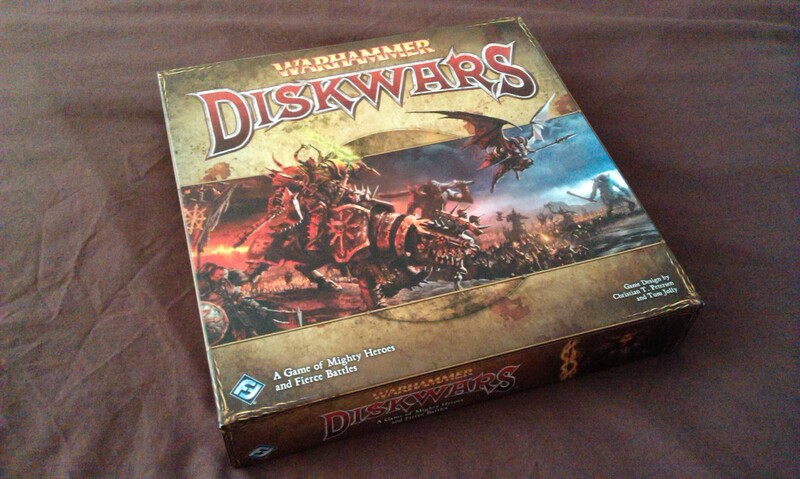 The core set for Warhammer Diskwars features everything you could want to play the game. While there are a lot of discs (62, actually), your actual army won’t necessarily be all that big, due to the recruitment rules. Remember that each hero has a recruitment value at the bottom of the disc? This is the number of points you can use to build a regiment around that hero – other units have a unit cost in the same place. Returning to our old friend Archaon the Everchosen, he has a recruitment value of 33, so you can use up to 33 points of units in his regiment. The Hellcannon shown earlier costs 12 unit points, so takes up a lot of points, whereas something like the Kurgan Marauders only cost 5 points. There are other restrictions, which prevent you from having two Hellcannons with Archaon for instance. You can have more than one regiment within your army, which you decide upon before playing. The number of regiments then determines how the deployment zone is laid out, with deployment cards granting special abilities to units deployed from that zone. Finally, if you have any recruitment points left unspent, these can help you gain the initiative, as players roll a d6 and add any unspent points to determine who goes first. Aside from getting the Ghal Maraz first-player token, going first can have its benefits in that you may be able to pin rather than be pinned! Of course there are expansions for the game – just two currently, one for the Dwarves and one for the Vampire Counts, though both bolster other races to some extent. Hammer and Hold brings the Dwarves to the battlefield, as well as providing supplemental discs for the High Elves and Empire, and introducing two more races, the Lizardmen and the Wood Elves, albeit in very small numbers. Legions of Darkness follows a similar path, with a new Vampire Counts faction, alongside Chaos and Orc reinforcements, and Dark Elves and Skaven as support races. Some really cool new keywords also appear – Guard, for instance, acts as the opposite to Impact and deals damage to a unit that flips onto it, while Poison prevents damage from clearing, making it potentially easier to get rid of a unit through other abilities. Back in January this year, FFG announced they were no longer supporting organised play for the game, which many players felt was a death-knell at large (that, combined with the End Times that was running through Games Workshop, of course). However, at GenCon this year, FFG stated they still felt the Old World was a viable property, and while GW may be going into new realms with the Age of Sigmar, Warhammer Quest adventure card game has shown FFG is committed to this world, so I don’t think we need to worry until they come out and tell us they’re not doing anything else for it. If they stay true to form, that would only happen with a final release, anyway, so if nothing else, there ought to be at least one last hurrah for the game. Personally, I’d love to see the four subsidiary races fleshed out – Lizardmen above all else – and also maybe some love for the Tomb Kings, even if it’s just one regiment that could complement the Vampire Counts. 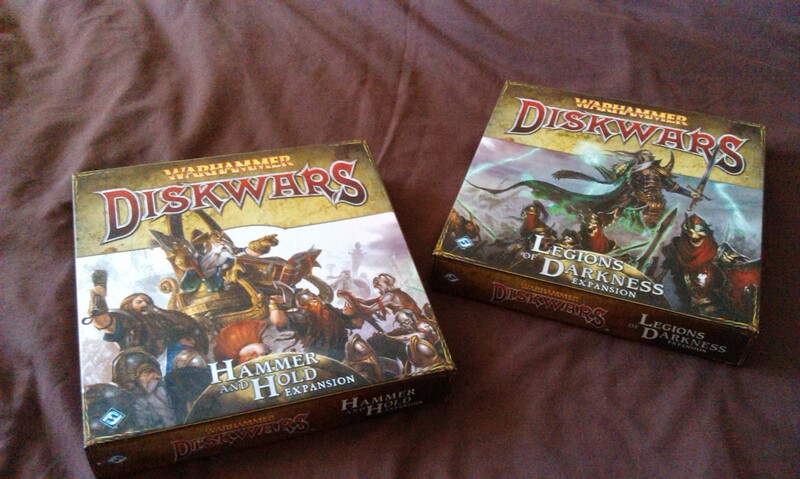 Warhammer Diskwars looks like an excellent game. Like I said, I haven’t had the chance to play it yet, but everything I’ve learned in order to write this blog points to it being a whole lot of fun. Sure, there are a lot of rules, and I foresee a lot of consultation with the rulebook during at least the first couple of games, but it should be a real blast, and I look forward to trying it out a lot. Army customisation should also be a lot of fun, as you look at which units to pair with which heroes, and perhaps combining factions into an army to take on your opponent. As with any such game, variety should be the spice, and while the two expansions look excellent, there’s always room for more in any wargame, so hopefully we’ll see something soon. However, overall this looks like a really solid game – when I get round to playing, I’ll be sure to have a write-up to either confirm or deny that, anyway! Yes folks, the New Age is upon us! Back in September last year, the Old World of Warhammer was shaken up with the End Times, which brought back Nagash and saw the destruction of the cities and peoples of the Empire by the forces of Chaos, headed by Archaon the Everchosen. The End Times extravaganza finished in March, with Chaos triumphant, and – officially, at least – Warhammer Fantasy Battles seemed finished. What could happen next? The internets was rife with rumours of 9th edition long before the cataclysmic events of End Times: Archaon, of course, but as things began to solidify, this Age of Sigmar thing turned into a completely new game. Rage-quitters abound, but now, it seems like everyone was just a little bit wrong. I was lucky enough to grab this yesterday, and have been perusing it over breakfast this morning. I have to say, things look pretty exciting for Warhammer right now! Seems like a whole new world is being created, and it looks infinitely expandable. Don’t just rush out to pick up this week’s White Dwarf for the free miniature stuck to the cover – read it, and you’ll see what I mean. Very exciting things look to be on the horizon, I must say. Reading the lore, I was struck by two things. First was the futility of Chaos. It’s something similar to what seems to be the Tyranid problem – when a destructive force has destroyed everything else, what will it do next? It always feels like something that hasn’t really been thought out properly. Also, Sigmar seems like a bit of a jerk. Having brought peace to the new realms he discovered, as soon as Chaos finds them he basically bolts the door and leaves everyone to it. There are also three new paints coming next week, including a brighter base gold called Retributor Armour. Always nice to have more options! The base colours are pretty much done now, though I haven’t managed to get any more done to it yet. As with the Catacomb Command Barge, I like the look that results from just having the base colours blocked in, so while it might not be enough to win a painting competition, I’ll stick to my usual MO, I think. True to form, I have dozens of unfinished, half-painted miniatures hanging about the place, and I’ve moved on to yet another model – the C’tan Shard of the Deceiver! I believe the Nightbringer is the more powerful of the shards, but I just love the pose on this one! While, on the whole, the finecast took minimal preparation (very few airholes), putting it together has shown that some greenstuff will be required here. I want it to be something of a centrepiece model for the army – even though I have lords and stuff who are probably more important, the fact that this guy is just so tall (though, oddly, he’s smaller than I thought he’d be) means I want him to stand out. The “official” colour scheme has that wonderfully burnished gold-with-cream-cloth look, but I’m currently thinking of orange-yellow with perhaps a purple cloth. It may well tax my painting skills to actually do this, but I’m looking forward to it. Awesome! The new Battlelore army packs are very exciting, bringing more options for the existing Daqan and Uthuk armies in the base game. While I’ve only played it once, it was a lot of fun, and I look forward to being able to play it again very soon! The third army was recently announced, of course, which is also very exciting, but I think I’ll always be an Uthuk kinda guy at heart! Rune Age has shown me the truth of that! A lot of the Hernfar Guardians models were broken upon arrival – all told, six models were in bits. FFG has really good customer service, though, so I’m hoping they will replace them, as I don’t think I’ll be able to glue them back. We shall see, anyway! The big Siege Golem comes in parts that snap together, much like the Roc thing in the base game, just in case you were wondering – in the montage above, he’s been dry-fitted together, but I think I’ll glue him together to make sure he stays put. 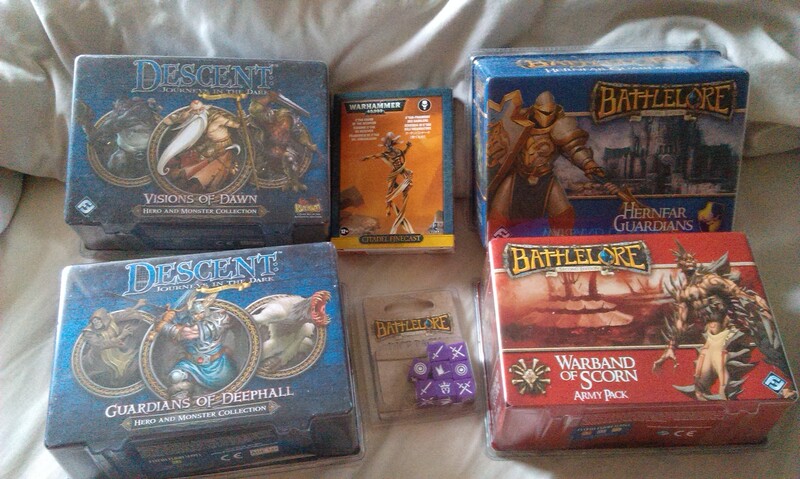 As for the new Descent stuff, well that’s just all sorts of awesome. Descent is a game that has been languishing in the unplayed pile for far too long, though the recent spate of co-op scenarios has enabled me to get it to the table for solo games, if nothing else! I’ve been enjoying these Hero & Monster collections, the first three of which I took a look at back in November. The most recent release, Visions of Dawn, included a new hero sculpt for Nara the Fang, who was originally released as one of four promo heroes for the original game (with crossover hero cards for Runebound and Rune Wars). The new sculpt appears to have retconned his entire species, but it’s still an awesome-looking miniature, and inspired a game with the new Dark Elements co-op scenario that I had a short while ago, but have only just now had the ink to print out the rules! I also love the Merriods! Descent is one of these games that I’ve mentioned an awful lot on this blog now, so I think I should probably devote an up-coming game day to the game. Keep your eyes peeled for that! Well, I am a very excited chap today! Not only do I now have a week and a half off work (just when the weather is set to turn bad…) but I’ve finally caught up with the awesome news from earlier this week regarding the upcoming expansions for Battlelore! 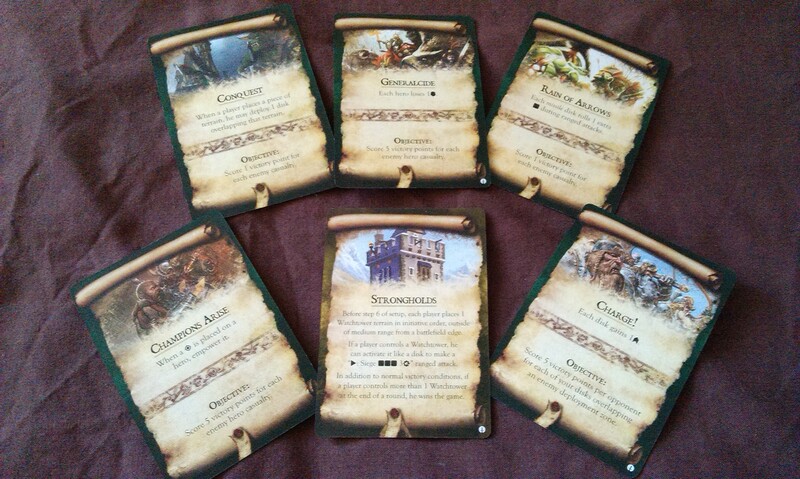 Battlelore is a game that I’ve only gotten to play once, but loved it – not least because I love the lore of the world. It’s a Terrinoth game, so set in the same world as my beloved Runebound, though it has the factions in common with Rune Age and other Terrinoth 2.0 games. I’ve talked about some of the expansions that have been announced for it before, such as the army expansions to the base game, as well as the standalone neutral chaps, which are all very exciting of course, though I still feel aggrieved about not getting to play the base game for ages! The closest game to this is the aforementioned Rune Age, which I love and play as regularly as I possibly can. In it, the Waiqar the Undying faction are among my all-time favourite factions to play (though I think I’m still a Uthuk Y’llan at heart). There’s a lot of magic implied in the necromancer faction, which has made them the natural opposite to the Latari Elves I suppose, so it’s interesting to wonder if we’ll get those chaps for Battlelore next year, maybe. Folks have been crying out for more armies for this game pretty much since it began, so it would be nice to see that. 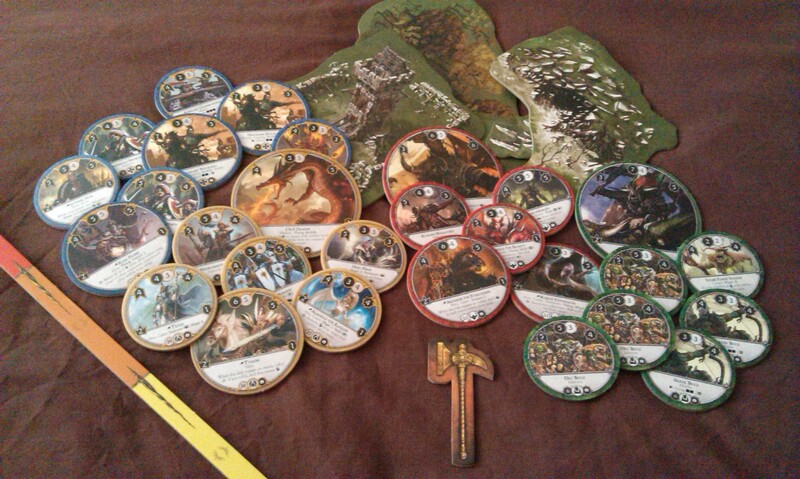 Part of me is also hoping that Battlelore expansions will pave the way for more Rune Age further down the line. Back in the day, Rune Age and Runewars seemed to almost co-exist as one was expanded then the other in an almost-leapfrogging manner. Runewars came with four fantasy races, and its expansion brought more troops; Rune Age was then expanded with those more troops and two new factions. 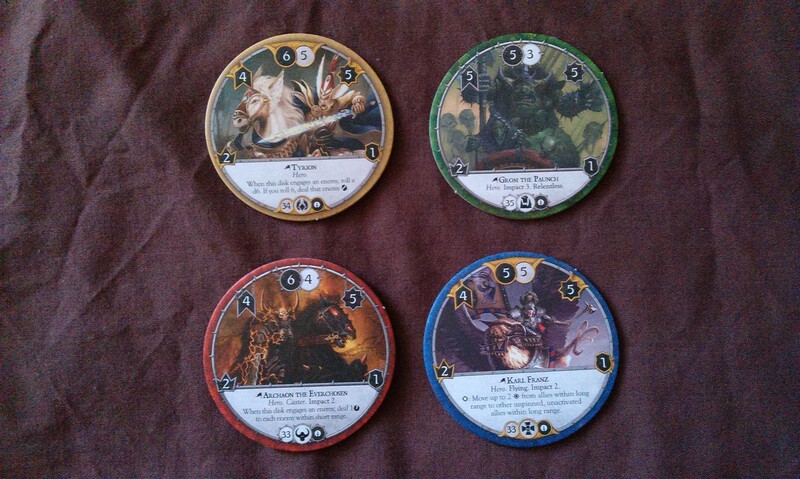 While Runewars appears to have been superseded by Battlelore as FFG’s tabletop wargame in Terrinoth, I still hope a connection is made with the card game, and more stuff comes out in due course! The fact that the expansion model looks like a wargame does worry me a little. Simply from a financial point of view, of course, I prefer having one boxed expansion rather than these multiple smaller things. I also prefer to have boardgame expansions in a solid box with all the bits kept within, not these plastic things that you have to destroy to open. It looked like Imperial Assault was going to follow this trend, while Descent certainly appears to have shifted to that sort of expansion model. It’s a bit worrying, as we see individual stuff like the Razorwings and the Mountain Giant coming out singly, but I suppose there’s no real requirement to get these things straightaway. For the completist collector, it’s a bit of a nightmare, but having so much awesome stuff coming out is nevertheless really exciting! Author spalanzPosted on June 11, 2015 Categories board gamesTags Battlelore, expansions, Fantasy Flight Games, Terrinoth, wargames2 Comments on The Undead are coming!